More than 72,000 people died from drug overdoses between January 2017 and January 2018, according to new estimates from the Center for Disease Control. That represents a 14 percent rise over 2016, despite a year of calls for action on the drug epidemic from national politicians and the media. Drug deaths continue to eclipse every other cause of non-disease death in the United States, including car crashes, homicides, and suicides. More people died from drug overdoses in 2017 than at any point in the preceding two decades. The driving force behind last year's increase is the dangerous class of synthetic opioids called fentanyls, predominantly the medical painkiller fentanyl, but also deadlier analogs like carfentanil and acetylfentanyl. 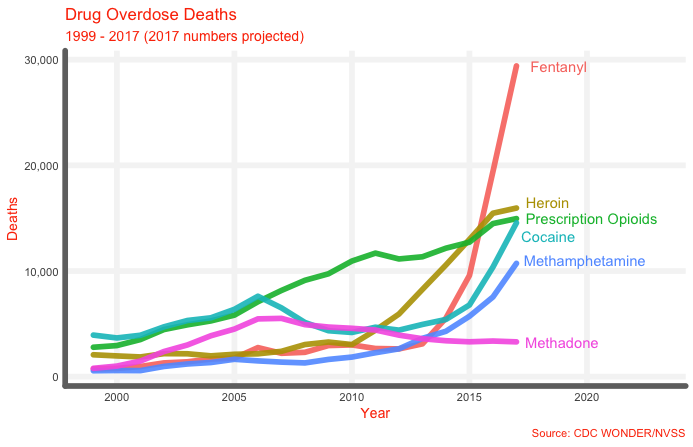 Indeed, while fentanyl overdose rates have continued their meteoric year-on-year climb, rates of death from other opioids—heroin and prescription drugs like OxyContin and hydrocodone—appear to have slowed. What was once a prescription drug crisis, and then a heroin crisis, might now rightly be termed a fentanyl crisis. Fentanyl was virtually unknown in the world of drugs until four or five years ago, when it began to appear in the United States and at the border. Prior to then, America had experienced a steady rise in the rate of overdose deaths associated with prescription opioids, a complex epidemic tied to irresponsible pharmaceutical firms, over prescription, and a culture eager to treat its pain. Policymakers responded by turning off the faucet of pills, causing per-person rates of prescription drugs like OxyContin to fall. This crackdown, especially the introduction of tamper-proof formulations, almost certainly instigated a mass switch from prescription drugs to heroin starting in 2010. Heroin deaths began to rise, driven by the funneling of black tar from Mexico by cartels seeking to capitalize on the high-demand American opioid addict market. However, deaths associated with fentanyl took off in 2014. The reasons for the switch from heroin deaths to fentanyl deaths are complicated. While few users are taking fentanyl directly—even just a few grains of the drug can be deadly—many are exposed to it after it is added to heroin, cocaine, or methamphetamines. As such, the number of heroin users may not have changed, but the deadliness of the heroin consumed ratchets up. The reasons for fentanyl adulteration—or even the sale of fentanyl by itself—is pure profit. Heroin is a semisynthetic drug, refined from the opium extracted from poppies, which must be grown and carefully tended to. 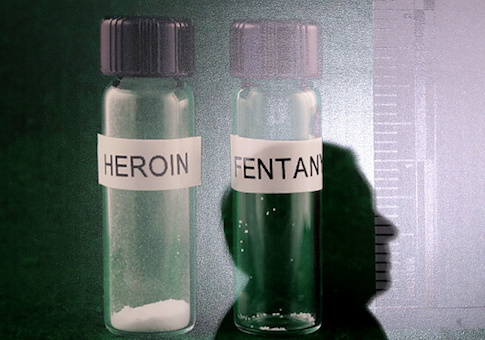 Fentanyl, by contrast, is wholly synthetic, and can therefore be made in a controlled environment. In the case of the modern epidemic, that environment is factories all across southeast Asia, thanks in large part to Chinese drug traffickers. There are two additional reasons fentanyl is attractive to modern traffickers: it is easy to smuggle, and massively profitable. Once produced, large quantities of fentanyl are smuggled over the southwestern border or, often, simply shipped through the U.S. mail. Once in the country, thanks to their potency and the relatively low cost of production, fentanyl can be turned around at enormous profit margins: a kilogram of fentanyl costs $4,000 in China but can make $1.6 million in profit on American streets. While fentanyl is at the forefront of the crisis, responsible for nine deaths for every 100,000 Americans in 2017, it is not alone in in its increase. Deaths attributable to cocaine and methamphetamine have spiked sharply, rising more in 2017 than either heroin or prescription opioids. As the Free Beacon previously reported, the meth spike is driven largely by the flood of the drug across the southern border. The explosion in cocaine deaths, meanwhile, almost certainly predominates among African Americans, creating a black drug crisis to parallel the white-dominated opioid crisis. The preliminary estimates issued by CDC involve more detailed breakdowns of drug overdose rates by state, albeit not by type of drug. These, too, paint a dark picture: Overdose death rates rose in 38 states and the District of Columbia. Rates fell in 12 states, although four of these had fewer than 150 deaths from drugs in 2016 and 2017, indicating low incidence rates to begin with. There is one silver lining: the CDC finds small but noteworthy declines in the opioid-ravaged northeastern states of Vermont, Massachusetts, and Rhode Island. This entry was posted in Issues and tagged Drugs, Opioids. Bookmark the permalink.